Pudong Airport is a core hub of aviation within Asia Pacific. With a total building area of 480,000sqm, the new T2 terminal is made up of three parts: the main building, 414m long and 138m wide, boarding hall, 1,404m long and 66~90m wide, and the corridor area at an occupancy area of 70,000sqm which links the main building and boarding hall. 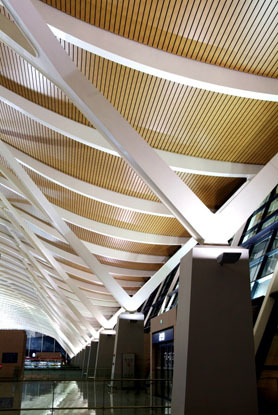 Hunter Douglas supplied 125,000sqm of grained Luxalon® Linear 180 ceiling products to the Terminal 2, which was completed in December of 2007. The curved ceiling system fits in well with the wavy roof to create a comfortable, warm, welcoming space inviting people inside. 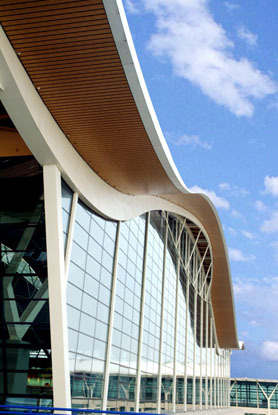 T2 simultaneously echoes and contrasts the design of T1 with its curved roof. 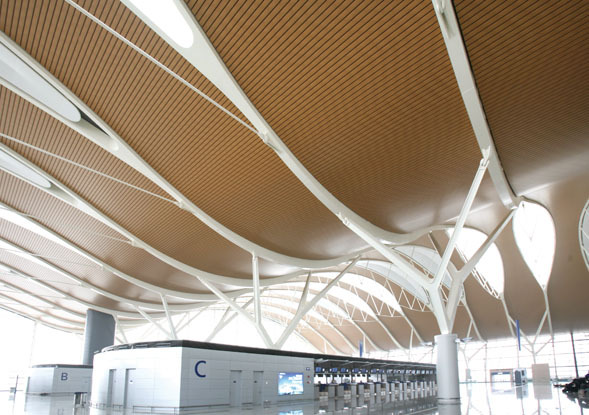 The new terminal uses the concept imagery of a flock of flying seagulls to symbolize the rise and development of Shanghai. Strolling in the roomy waiting hall of T2, travelers are immediately impressed by the spacious and bright atmosphere. The curved ceiling features the streamlined, natural shape, and the grained color of finish echoes the environmentally friendly, green theme. The surroundings are comfortable and have a relaxing effect on the occupants. 138 skylights, in total, covered with sun-screening film, can adjust for different seasons and climate requirements. When the skylights are open, this transparent film screens the glare from the outside, providing a comfortable and energy-efficient environment for the occupants.